The designing of the 959 naturally included a careful study of the passenger cell. We have already seen that one of the irrevocable conditions for the 959 was that it should have at least the same level of habitability and comfort as the 911. Taking the latter's basic frame as a starting point, the problem of the habitable space was automatically	resolved. In fact at first sight it is only the presence in the 959 interior of the large transmission tunnel which gives a clue to the mechanical modifications carried out. The dashboard is very similar to the 911. The fact that it is accepted in such an advanced technological car, for which Porsche, in their search for perfection, refused every compromise, is proof of how successful and satisfactory this part of the 911 was. Some changes were inevitable, especially the instrumentation. 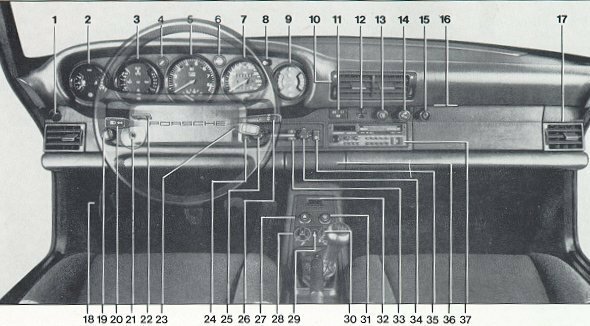 The main dials, grouped together as usual, in a dashboard in front of the driver with the steering wheel in between, are still five, as in the 930/911, but there are some interesting details. Starting from the left, the first instrument includes the fuel level indicator (the tank takes 85 litres) and the oil pressure; the second shows the temperature of the cooling system and the oil pressure, with a warning light for blockage of the transmission. In the center of the dashboard is the large rev counter with a scale up to 9000 rpm, with the red sector at 7750. In the upper part of this quadrant is the blue full beam light for the heads, underneath, like the 930, is the turbo pressure indicator (scale up to 2.5 bar, in the 911 Turbo the hand stops at I bar). On the right of the rev counter is the speedometer, scaled up to 340 kph, six-figure total mileage counter, and 4figure partial counter with turn back facility. The most obvious difference between this and the 911/930 instrumentation is the last quadrant on the right: on "normal" models this dial holds an analog quartz clock, in the 959 it is replaced by a group of four lights representing the four drive programs available (dry tarmac, wet, snow and difficult terrain with traction problems). When a program is chosen the corresponding light comes on. At the side of the rev counter are the lights which indicate the height of the car from the ground and the hardness of the suspensions. 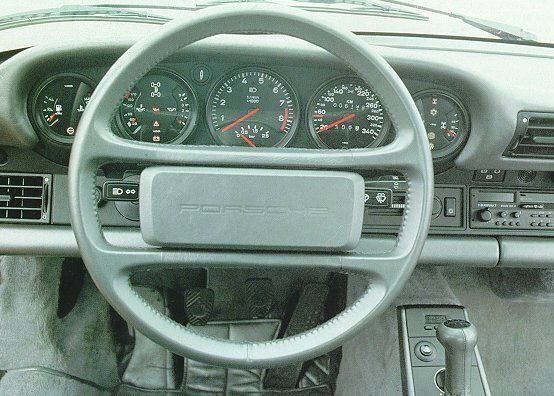 The rest of the dashboard is virtually unchanged compared to the current 930. 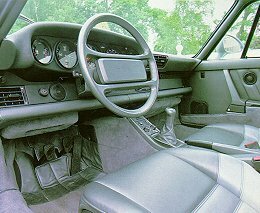 The main controls for lights, rear fog-lamp and ventilation are the same, but the little console with the controls for the air-conditioner and the heater, which was originally divided into two and worked by four moving levers and two buttons, has been modified to a simple and successful design very similar to the well-tested one on the 944 Turbo, with direct temperature selection. In front of the steering wheel are the usual headlight levers, the direction indicators and the windscreen wiper/washers. Also on the right is the lever for the drive programs. The steering wheel is classical leather-covered four-spoke Porsche. The central console, down between the two seats, is virtually unchanged from the 930. Instead of the two round buttons for the air-conditioner there are two shaped handles: the one on the left is to select the hardness of the suspensions, the one on the right is for the car's height from the ground. The two push buttons for the heated rear window and the hazard lights are the same. The gear lever has the same shape as on other models, with a different diagram on the knob for the seven gears available. 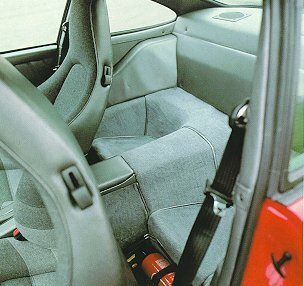 The rest of the passenger cell is a more classy example of the current Porsche school. 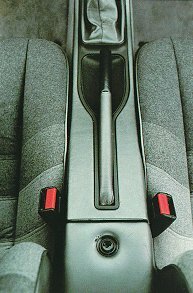 The front seats, specially produced for the 959 in leather or material as the client wishes, and are well-shaped and include the headrest. They are electrically adjustable for height, back angle, distance from the steering wheel etc. The interior is carpeted in high-class carpet with a specially treated leather trim ("Metallicleder"). Standard equipment on the road model (also known as the "Komfort version") includes all the amenities to be expected a on a car of the 959's style and price. So as well as the height, drive and suspension controls already mentioned, there are air-conditioning, electric windows, central door locking, Blaupunkt Bremen SQR 45 or Köln SQR 23 quadraphonic radio, electrically controlled right and left wing mirrors. The particularly sophisticated air conditioner should be mentioned. There is constant control of the temperature which the driver chooses using a graduated scale on a rheostat on the dashboard, by automatic operation of the servoactuators which where necessary open the warm airflow (from a radiant block derived from the circulation of the cylinder head liquid) or the cold airflow (from the A/C radiator/compressor). The air passes through an intermediate mixing chamber upstream from the interior inlets. 'Temperature sensors outside the car and in the mixing chamber (fed by a small fan to speed up the process) transmit all the necessary information to the tumperature processing unit, which on the basis of the information recieved adjusts the operation of the actuators required.